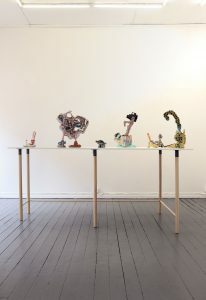 Anna Tedestam is a sculptor by true vocation. 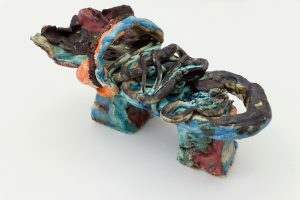 Her medium of choice is clay, with which she has a visceral creative relation. 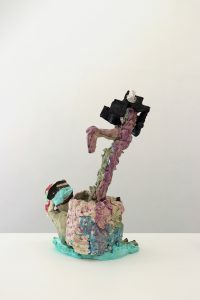 Through a flow of emotions, she digs for symbols in this earthly material to transform feelings into shapes of ceramic, porcelain, stoneware and plaster — often mixed together. 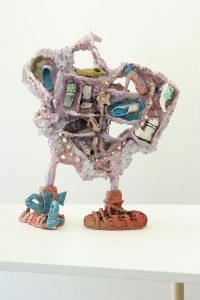 For Tedestam clay is the material from which she can build an alternative world, a place that speaks her own personal truth. 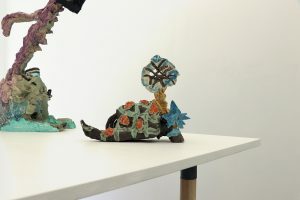 The intricacy of her sculptures reflects an intimate and vital cycle of finding and building, of pure observation versus active creation and reinterpretation. She explores what the material offers her and she bends its characteristics into impossible architectures and into a dance of unbalanced colourful shapes. 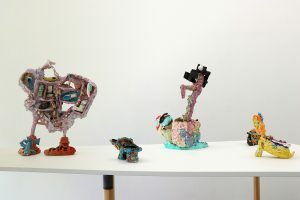 The series of sculptures presented in Nobody Puts Baby in the Corner! 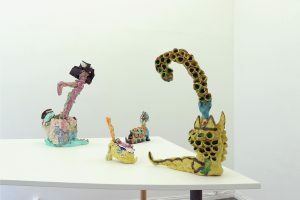 — her first solo show ever – is crawling with symbols and stories, humorous and mindful at the same time. 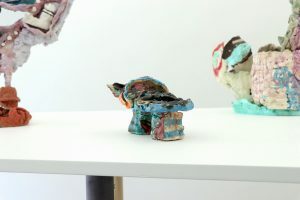 Anna Tedestam masterfully manages with her work to transcend the stillness proper of sculpture as her creations become alive in their deliberate imperfection and in the visible traces of the intuitive, unconstrained process behind them. Anna Tedestam (1991, Uppsala) lives and works in Stockholm where she is currently attending the Master program at Konstfackt University of Arts Crafts and Design. Her work has been exhibited at Stockholm Affordable Art Fair 2017, at Köttinspektionen in Uppsala, at Liljevalchs in Stockholm and at Galleri Småland in Alvesta. Tedestam has completed a public commission in 2017 for Strängnäs, she is currently working on a show with Art Nou Mil.lenni Gallery in Barcelona (Spain) and on a new public commission for Lidingö. Nobody Puts Baby In The Corner! is her first solo exhibition with Nevven Gallery.